And wouldn’t that be good. Imagine how much that can save. I’m going to explain how. Once you set up your email, your business system, it’s going to depend on list building. So catering email addresses and your lead magnet and so on. So you get people into a list, and then you need to be building relationship with them. And nurturing. Now the beauty with some things such as Aweber or the paid version of Mailchimp and Infusion Soft and all of these others is that you can set up what I call auto responders. Now we actually use Aweber. Aweber invented the auto responder many years ago. 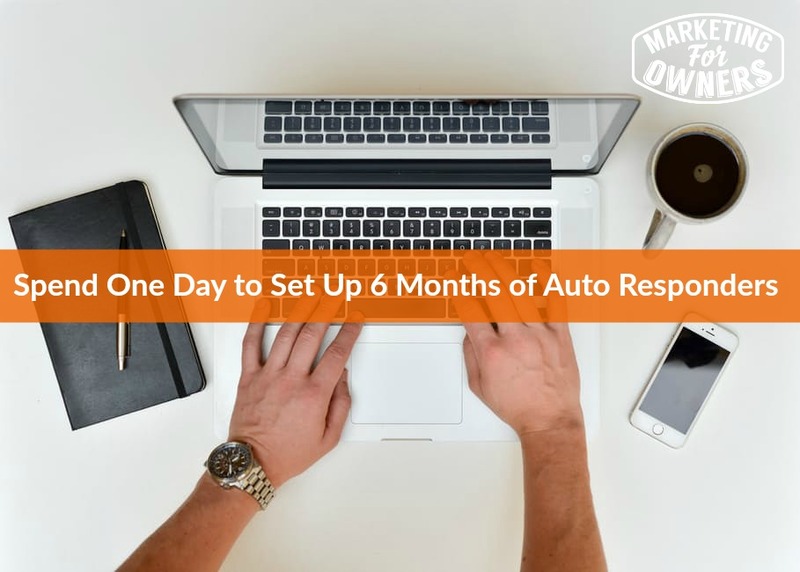 And what that means is that when somebody is on your list, on your email list, then they simply sign up on a particular day and you can set it, so that on say day 3 after they sign up an email that is set up, will automatically be sent out to them. So once you’ve set them up, it just happens. Now if you think about this. On day 1, or just before day 1 of the very first person that ever signs up. If you write the emails for that person ahead of them going out, every single other person that follows after that will get those same emails. You only have to do it once. And you could have a thousand people sign up, and they are all getting that same sequence. So I want to give you a little bit of a thought on how to set these up. Now first of all the, normally when someone joins your list, there is one email that goes out immediately, which is the introduction one. There’s no time delay on that. Always goes out straight away. And on that one, you want to be saying hello, you want to introduce yourself very very briefly, because they’ve just found out who you are, they have just signed up for something. So just say hey Jon here, etc. here is the download or something or whatever you have, whatever they signed up for. Give it to them straight away. Do not delay. Make it right at the start of the email because that’s all they want. But then, follow on with a little bit. And again make this short, little bit of expectations of what’s to come. You can say something like, there’s you’ve been in this for years. You’ve been doing this for years. And you know a lot of things. So you might send them a message here and there to let them know and to keep them up to date with things, but you won’t hassle. And you can point out, there’s always an unsubscribe button on every single one. So you won’t, you won’t hassle them too much. Always set the expectations and always be honest. Ok. So and remember these emails must be sent from an email service provider. We are not talking about sending them from your Gmail with some kind of scheduling tool or from your outlook or something like that. That’s spamming. Because you are going to break some of the spam laws. Some of them, yes very serious. Remember people can pick your stuff up in any other country. So if they pick it up in Canada, they have some serious email laws. So make sure you use email service providers because they’ll keep you on the right side of the law that you probably didn’t know existed. You sent one, now on day 2, how about just sending them another short one, and say, ‘Hi again, just wanted to make sure that you’ve got yesterday’s email. Please hit reply to this and just tell me yes or no. So that I know.’ That’s it. Now what you’re doing there is you’re trying to encourage them to reply. That sends signals to people like Gmail and outlook or whoever, whoever is their internet service provider to say that oh, because if they reply to you, this tells them a signal, oh people reply to this, this isn’t spam, this isn’t stuff that everyone hates. Now, they might not all reply. They might not all say this and that. Don’t worry about that. It’s all good. But trying to encourage people to speak is fine. Okay, it’s all good. It’s all good. So you don’t have to send something every day. The next one, you might delay it a couple of days. And say, something such as checking in, and you just want to talk about something that you use in, say the report, the checklist, the whatever. Start to, start to join that report, checklist download or whatever to, whatever product or service you eventually want to sell them. And start to talk about it. Now make these friendly, use storytelling, use an example of someone or you who used that point and the result they got. That’s what you’ve got to do. Then a few days later, start to expand, you can slow it down. Unless you are on a quick sales process. But start, we prefer to build a process overtime. Because remember, you’ve probably read it a thousand times that people start to know and like and trust you after a number of contact points, a number of touch points. Some people say oh after 7 emails, after 9 emails, after this. There’s no proof. Everyone’s just making it up. One person said it one day and everyone else just copied and assumed. But you just know, you just need to know that people are fussy these days. They’ve only met you through email, through a website and so on. They need to trust you. So be nice, be normal. And so whatever report it is, just talk about it. Every few days and then get into a routine. It can be every every 7 days, every Tuesday or something like that. Just build it up. But what I would also suggest is trying to get people in these emails to come back to your website. So you can put a story in and refer to something on your website to bring them back. And then do not try to sell things. Do not openly try to sell. However you can put in something like, say on, say after the 4th one, say or 5th one, say in a P.S, say by the way, if you deal with clients, you have a few, say one of our client’s contract is coming to an end, if you’re, if there’s something in my services that you’d like, please get in touch with me by calling me on, this will be on a first come first serve. People are usually cuing up. So I’ll be able to let you know what I do. You, that’s a call to action. People will contact you. But the important thing is that these emails, if you write them ahead of that first person that gets them, you can write one a week, and you can extend a sequence of 10, 15, 20, 30, 50 emails. You can have the whole year and every person afterwards gets them. And if you want to change offers, want to make adjustments, you can go back in and then make a little adjustment, and everyone else gets them afterwards. It is very very feasible to set up an entire year of emails. You can do it very quickly. I mean I actually set it in one day, I was, say you have 2 choices. You can either sit down and just write them out for the day. And then it’s all done. Or you can then just add one here and there as long as it’s before the next person is due to get the next one. It’s very very easy. It’s not as overwhelming as you think and when it’s done, it’s done. It’s a beauty of this system. Remember those emails, they are going to nurture the friendship and relationship. Always use stories, always use examples, always keep it on topic. On topic of what you sell and related to what they signed up for. Simple eh? Anyways, it’s Monday, very cold here in South Surrey in Canada in beautiful British Columbia. It’s absolutely freezing. And it is time for a Book for the Week. And this is a classic. This is one of my all-time favorites. 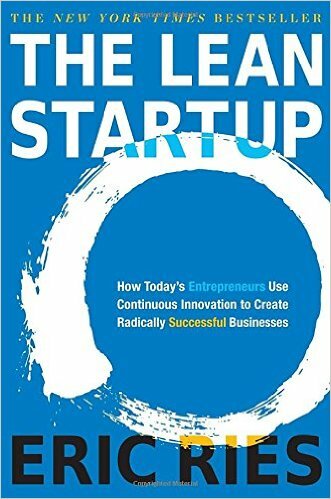 It is Eric Reece who wrote The Lean Start-up. Now this was written really based on software companies but we used this as a basis for launching our fire extinguisher servicing division of the company. And that division did a 100,000 pounds in the first year from a zero start-up. And you think, oh but you’ve got all those customers. No, we only then marketed to future potential people. We don’t go back to previous ones, we set up a system it works. 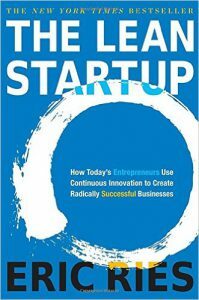 The Lean Start-up, absolutely brilliant. Classic book. I strongly recommend it. Okay, see you tomorrow.